With this entry, we mark one year of the Yiddish Song of the Week blog. Thirty-two songs have been posted to date, and we hope to improve upon that number in the coming year. Once again a sheynem dank to Pete Rushefsky, Executive Director of the Center for Traditional Music and Dance and our webmaster for this project of CTMD’s An-sky Institute for Jewish Culture, and to all of those who have submitted materials. Please spread the word and send us your field recordings of Yiddish songs! 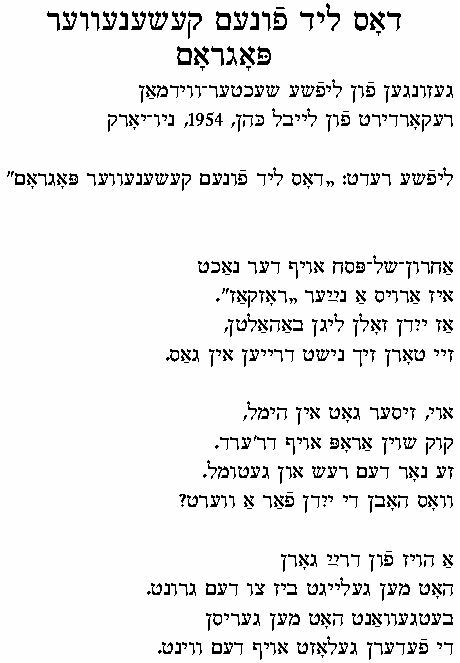 In Eleanor and Joseph Mlotek‘s song collection Songs of Generation, they include a version of the song as it was adapted during the Holocaust (see pages 277-278 attached below). It differs textually from this version in most verses. Where I was not sure about certain words, I placed a question mark in brackets. For the last line of the refrain the Mloteks wrote „Re‘ey ad‘‟ [Look God!] I could not hear that in this version. 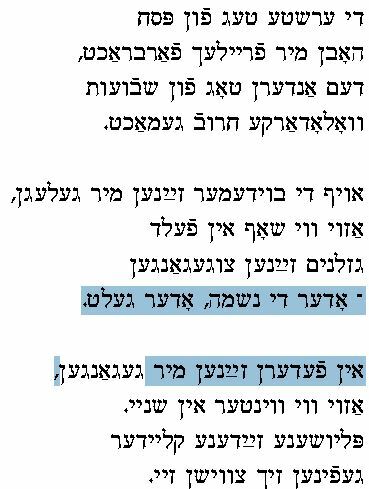 She also sings here “Cast a glance at the Ukrainians‟ but in the Mlotek songbook it says “Cast a glance at the Jews.‟ But when she sings “Ukrainians‟ in this sentence, she means Ukrainian Jews. 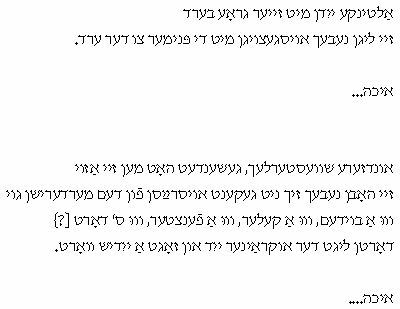 „Eykho‟ is also the Hebrew name for the Book of Lamentations. This is the first recording available of the song and it was made by Crasner’s son-in-law Bob Freedman. Cick here for more information about the singer, Clara Crasner. Clara Crasner: I went I came over the border to Romania, and – You listening? 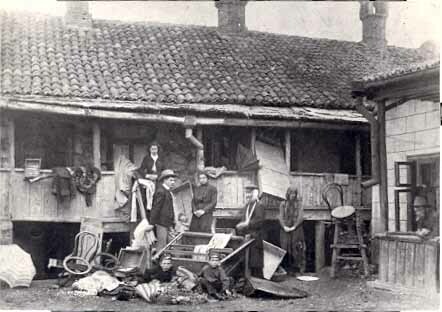 and wanting to continue onto other towns – I had no passport, so I traveled with the impoverished ones from one …. Every day we were in a different town until I came to Yedinitz. Freedman: Who is talking now? Crasner: Clara Crasner, born in Sharagrod. 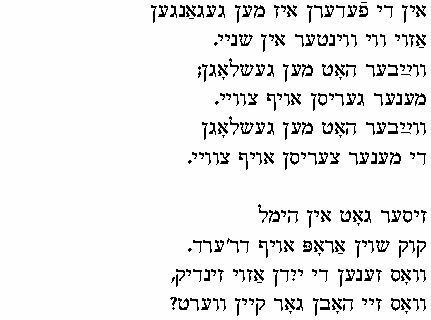 Crasner: The song is from Bessarabia; Jews sang if for us from the Ukraine, describing how we felt upon arriving to Romania. Es royshn nor himlen, es regnt mit blit. Es royshn di himlen, es regnt, es gist. Karbones un retsikhes in di merderishe hent. The sky is cloudy; no ray could be seen. The skies are rushing, it‘s raining blood. The skies are rushing, it‘s raining, it‘s pouring. Victims and cruelties are in the murderer‘s hands. Eykho, vi azoy? Vos shvaygstu dem goy? af di Ukrainer a blik. Eykho, how could it be? Why are you quiet against the non-Jew? let it come to an end. hot af undz rakhmones un nemt undz tsun aykh. Mir veln zikh banugenen mit a trukn shtikl broyt. Abi nit tsu zen far zikh dem shendlekhn toyt. take pity on us and take us in. We will be satisfied with a dry piece of bread. As long as we don‘t see in front of us a shameful death. Kleyninke kinderlekh fun zeyer muters brist. me shindt zey vi di rinder un me varft zey afn dem mist. zey lign nebekh oysgetsoygn mit di penimer tsu der erd. Little children taken from their mother‘s breast. are skinned as if they were cattle and thrown in the trash. are now lying stretched out with their faces to the ground. zey hobn nebekh zikh nit gekent oysraysn fun dem merderishn goy. Dortn ligt der Ukrainer yid un zogt a yidish vort. they could not, alas, get free from the murderous non-Jew. There lay the Ukrainian Jews and says a Yiddish word.